Golden Age of Jazz band for hire. The Arcadians breathe new life into old music and produce a musical history tour that is lively, informative and above all, entertaining. STRINGS AIN’T WHAT THEY USED TO BE! Once upon a time jazz was fun. It didn’t turn its nose up at popular music. It hadn’t forgotten the blues and ragtime. It even shook hands with country music occasionally. Sometimes it sang silly songs and played funny instruments. It could be virtuosic without taking itself too seriously. The Arcadians play and sing the music from this Golden Age – largely from the 1920s and 30s but sometimes as early as the 1890s; mostly American but also from other parts of the world. 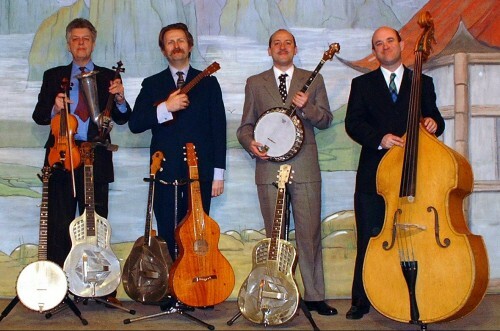 They perform on a wide variety of stringed instruments and their repertoire ranges from the familiar :- Django Reinhardt, Stephane Grappelli, to the obscure:- ‘Banjo’ Ikey Robinson, The Dallas String Band. They touch on blues, ragtime, country and Hawaiian music and show that not only is it all related but all great music and great fun. 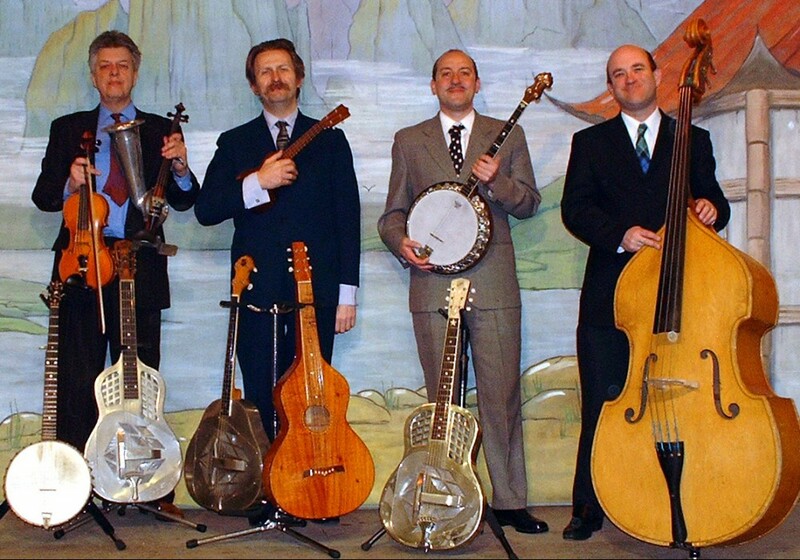 The quartet was formed by Martin Wheatley, who plays at least eight different fretted instruments during the show. He has made several concert tours of the USA collecting 78rpm records and vintage instruments on the way – guitars, banjos, ukuleles and Hawaiian guitars. He shares the vocal duties with Tom ‘Spats’ Langham. Tom is a former member of Bob Kerr’s Whoopee Band and a wizard on the guitar, tenor banjo and ukulele. Roger Graham (double bass) might have become a ‘proper’ musician. Fortunately for us he was, after graduating from the Guildhall School of Music, seduced by the world of jazz. His many credits include work with the Pasadena Roof Orchestra. Mike Piggott plays violin, guitar and the rarely heard Strohviol. His early career was spent playing with Ralph McTell, Bert Jansch and Pentangle. More recently he appeared at London’s ‘Genius of the Violin’ festival.